Britain’s future strategic direction #10 – RUSI and the balanced force. 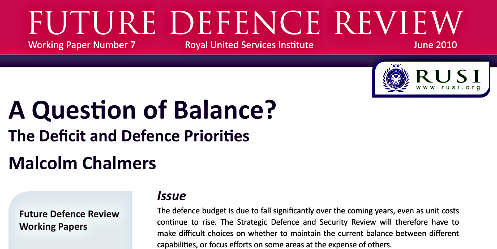 Malcolm Chalmers is the author of the latest RUSI paper on Britain’s Future Defence Review, and his interest in this paper is to seek a balanced force against the tide of coming cuts. His concern would be to de-emphasise legacy skills whilst preserving a regenerative capability on the understanding that while they are not crucial now we live in an uncertain world, and as such we must insure against the unknown. First and foremost it is recognised that we are overspent, over-tasked, likely to witness Defence budget reductions, and must therefore reduce the scale of our capabilities.